What does your TO DO list look like? Here’s mine. Just kidding. But I related (and laughed) so hard at the cat's unchecked box I had to include it. 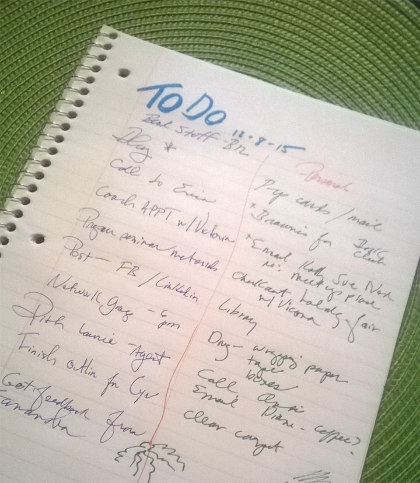 December inevitably adds activities and obligations (some fun, some not so fun) to our daily To Do list and we writers tend to get downright out of sorts. It’s already challenging enough to find time to write, but now chances are that work on your book will be pushed to a time period called the “New Year” where you will again renew your resolve. I invite you to put the power of the season’s overwrought emotions directly into your book. Evoking emotion is what good books are all about—it doesn’t matter whether you’re writing fiction or nonfiction. It’s what readers (also agents and publishers!) are looking for. People read to feel something different than what they’re feeling. The holiday season tends to generate extreme emotion, wild swings that range from delight to depression, dread to joyful anticipation, expectation to disappointment. Every writer is in the business of emotions. I recently had cause to recall that bit of wisdom I received from my mentor years ago. Here’s what happen. In November I took a trip to Colorado to see my sister for Thanksgiving and a few days after I got home to California I started having terrifying symptoms which were only activated at night, starting precisely at 8:00 pm—piercing headache, waves of pain going up and down my spine, violent chills and fever. I had thoughts like: I have a brain tumor or meningitis. This maybe my last Christmas. My son will miss me. Will I have this much pain all the time? If it’s my time, there’s nothing I can do about it. The symptoms abruptly subsided at 3 am. This happened three days in a row before my sister persuaded me to go to the Urgent Care clinic. It turned out to be a weird viral infection that went away by itself. All I did was take Advil, go to bed early and the symptoms became quite manageable and then faded within the week. But those strong emotions were real and powerful and I decided—having recalled my mentor’s timely wisdom—to take them to my writing table and use them. Most of the manuscripts I read are well written and have an interesting story line or purpose, but there’s one piece that is consistently missing: emotion. Fiction writers unfold the plot but they leave out the impact of the main character’s emotional reaction, assuming that the reader will fill it in. Or, in nonfiction, authors provide useful and often fascinating information but fail to generate excitement in the reader about what they can do with it, again assuming the reader will figure it out. So how do you take your emotions into what you’re writing? I took my experience of fear, pain and overwhelming sense of vulnerability and brought it to a scene where my main character experiences a realization about her mother’s death. The protagonist is the first woman Chief of Surgery at a prestigious hospital. This woman is brilliant and confident, and has a reputation for being cold and uncaring. When the violent symptoms come on, she takes a strong pain reliever to get through rounds. Unexpectedly a patient asks her, “Am I going to die?” The question penetrates her façade and she remembers her mother asking her the same question and the fact that she ignored it. She falters in front of residents and interns, staring at the woman and unable to respond. You’re writing nonfiction? You can do the same thing. Choose an anecdote that illustrates some key point or feature of your subject and put a recent emotion in there. Make sure the emotion is strong and raw. If it's not clear right away, give yourself a little time to sit with it. I would love to hear from you. Take a moment and share your thoughts below. I will read and respond to every comment. WHY 2016 IS THE BEST YEAR TO WRITE (AND) FINISH YOUR BOOK.